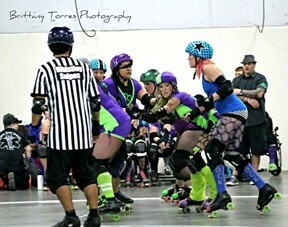 EYE OF THE STORM: The pack is a dangerous place for any jammer and the Broad St. Brawlers showed the Nor Cal Roller Girls no mercy on Saturday night. As you read this, there’s a very good chance I’m 30 years old. Either to the day, or one or two days passed the traumatic day when it happened. Of course, my life is over. Nothing interesting will ever happen to me again. I will never set foot in another country, never play hide and seek with my inebriated (adult) comrades, never bounce up and down in my chair as my favorite roller derby team lays the hurt on their opponent’s jammer. Never eat a container of frosting for lunch, while pretending that I don’t notice the judgmental looks from my coworkers. Alright, that’s all clearly a load of crap. I fully plan on doing all that stuff, and more, and I’ve got this Art Bash to prove it. It’s true, that on Friday, Feb. 7 I turn 30. Or turned, depending on when you read this. We’ll start with how I spent my final Saturday night as a young, carefree 20-something newspaper editor: Watching Central Coast Roller Derby’s season opener double-header at the Paso Robles Event Center, of course. The Broad Street Brawlers took on (and readily dispatched) Chico’s Nor Cal Roller Girls (225-141), although I was petty impressed by Nor Cal’s Amazon Blazin when she took her turn at jammer. Common wisdom seems to hold that it’s the petite players that make for the best jammers, but Amazon Blazin—as the name suggests—is not a petite player, and she racked up her fair share of points for her team by muscling through the pack. But what I was really excited for was the rematch between A-Town Asylum and Paso Aggressive, who faced off against one another at last season’s closer, and the match got rather heated. The players themselves kept pretty cool, for a contact sport, but the crowd was out of control, and I personally was dissatisfied with the endless litany of whistles and penalties right at the end. It was a little difficult to determine the final score, on account of the fact that I’ve been rocking a thick pair of old people glasses since I was about 16, but it looked like 216 Paso to 65 A-Town. I’m gonna be watching this rivalry pretty closely this season. I have to admit though that while yes, I have my favorite team and players, I’m sort of in love with the strategy of it all. Watching Blaque’N DeckHer lay a hit to help her jammer, Cass Whoopin’—who’s phenomenal—break through the pack is downright exhilarating. There’s nothing mindless or brutish about any of this. (Side note: I tried to keep track of how many players Blaque’N DeckHer knocked down but I lost count … in the first half. She’s awesome to watch.) While I’m dishing out kudos, Ivanya Skulz is like a freakin’ ballerina on rollerskates. And A-Town’s Corona Slamher takes her job as a blocker very seriously, making her an effective wall between the opposing team’s jammer and the points she wants to score. Also, I don’t think there’s a feistier player than Gigantor, whose name suggests that she’s aware of her diminutive height, but that doesn’t mean she lets anyone push her around. 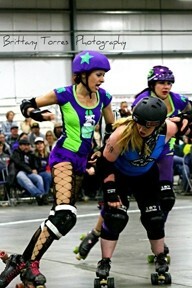 JAMMER POWER: Roll V. Wade fought for points for the Broad St Brawlers. I’d say my only complaint of the night was that there were no cupcakes for sale, and trust me, I looked. I think I took three laps around the track hunting for cupcakes, but found none, and had to satisfy my hunger with nachos. Which are good. But they’re not cupcakes. Just to keep everyone guessing, I’ll be spending my final hours of 29 … serving as a judge for the county’s high school Poetry Out Loud Competition. In fact, the event is free and open to the public, so if you’re interested in watching and listening as local kids perform poems to determine who advances to the state competition, drop by The Adult School, 1500 Lizzie St., Room J2 in SLO on Thursday, Feb. 6, at 7 p.m. I’ll be announcing the winner in next week’s Art Bash column, but if you want to get the jump on my announcement, you can watch it all go down in person. I don’t know if the students are allowed to hip check one another during their readings, but that’s something I’ll definitely be watching for. Of course, how you leave your 20s—hooting and hollering at a roller derby match and sitting stone-faced and giving nothing away as a judge of a high school poetry recitation—is important, but so is the manner in which you enter your 30s. Will I be classy and dignified? Will I be sprinting madly or hiding in a tree during an intense game of hide and seek? More likely. I’m not being coy. I really don’t know. My boyfriend’s got something planned, but won’t tell me what. As long as there are cupcakes, I think I’ll be OK.